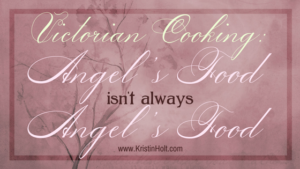 Victorian Cooking: Rotary Egg Beater ~ In Time for Angel’s Food Cake? BEATING EGGS PROPERLY, especially when preparing cake batter, took a great deal of energy, time, and forbearance. 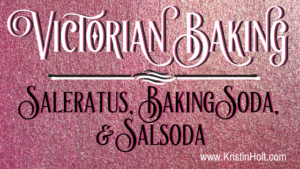 Victorian inventors created a new, time-saving, energy-saving device that quickly became a favorite of (most) cooks, everywhere! The Egg Beater–a labor-saving device for the household kitchen. 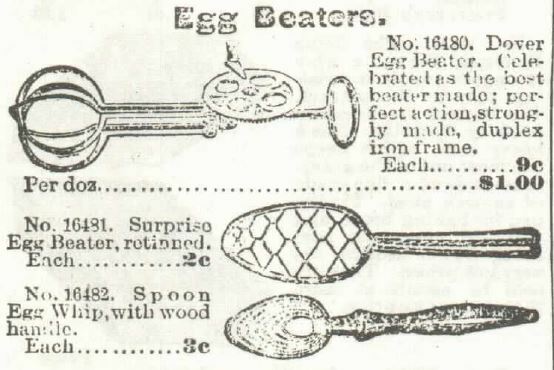 Eggbeaters, Late 19th Century, courtesy of Michigan State University Library, via recipes.hypothesis.org. 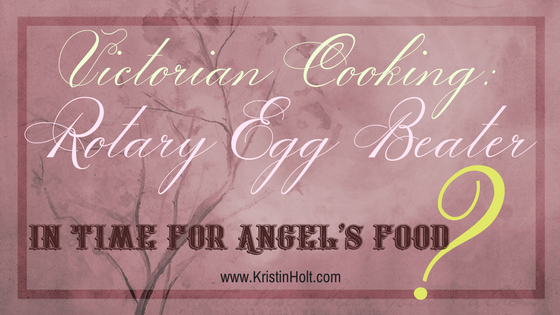 Were egg-beaters in time for the Angel’s Food Cake Craze? 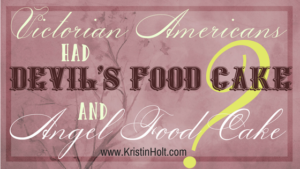 Angel Food Cake showed up in Victorian American Cook Books as early as 1878, and continued for through the decades. 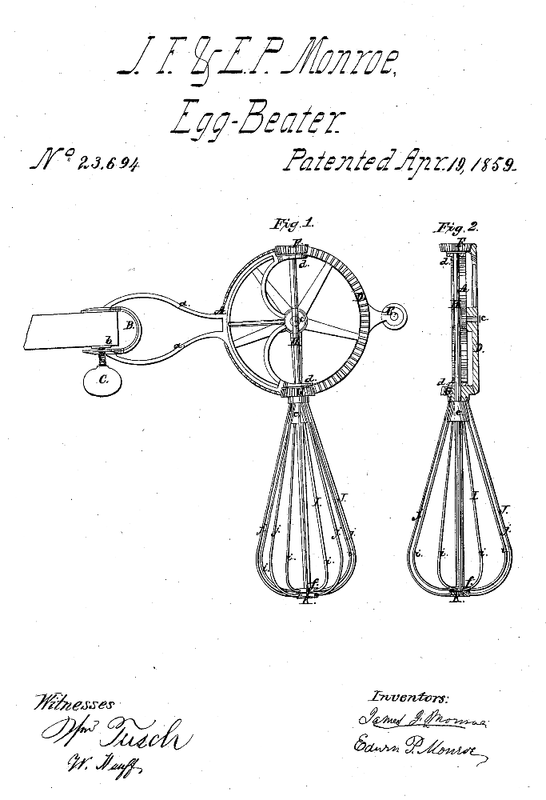 Predecessors to the FAMOUS Dover Egg Beater, Patent May 31, 1870, had been around for decades! So, yes, absolutely. Egg beaters were around in plenty of time to help home bakers (and bakeries) make Angel Food Cakes. “We made egg beaters… used birch wood for that as the wood did not give off any taste. …the smaller ones were used for beating eggs and cream.” Writings of Farm Women, 1840-1940; An Anthology. Edited by Carol Fairbanks, Bergine Haakenson. Image: Google. Egg Beaters for sale in hardware section of the general store. Published in New Orleans Weekly Delta of New Orleans, Louisiana on January 22, 1849. Part 1. Egg Beaters for sale in hardware section of the general store. Published in New Orleans Weekly Delta of New Orleans, Louisiana on January 22, 1849. Part 21. 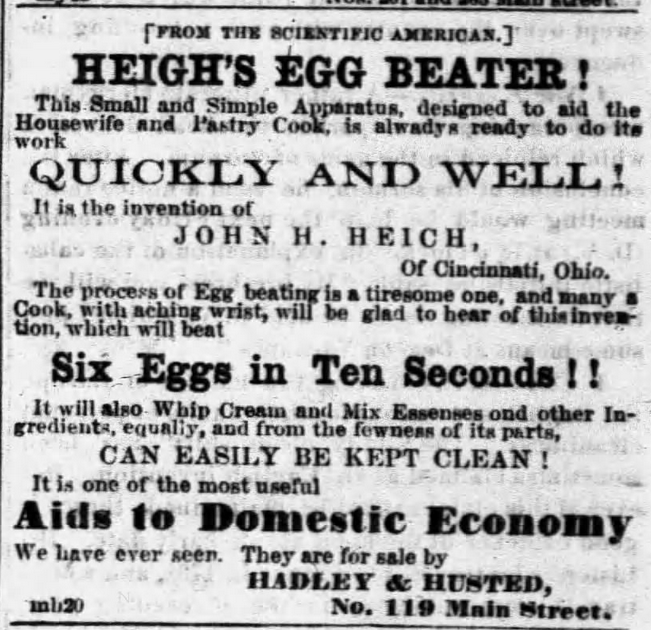 EVERY WOMAN should have one of those Egg Beaters which can be had at LANGWORTHY & WASHBURN’S. Published in Oshkosh Democrat of Oshkosh, Wisconsin on November 1, 1850. An egg-beater is included in a merchant’s list of Household Essentials. Published in Buffalo Daily Courier of Buffalo, New York, February 17, 1853. United States Patent No. 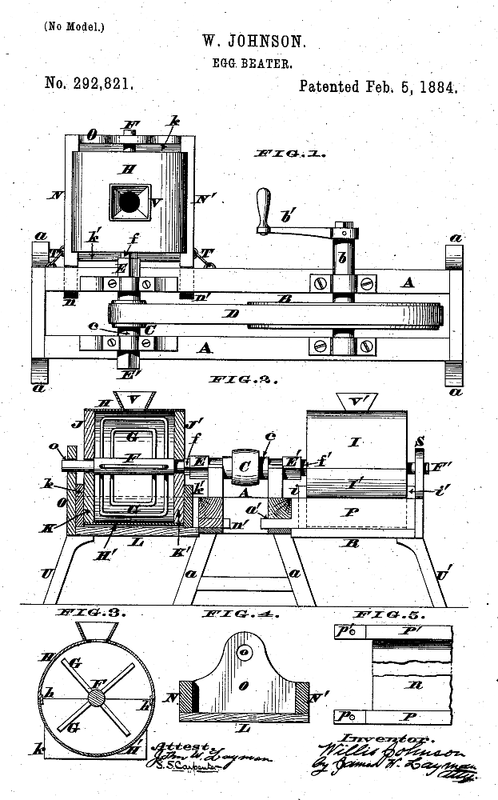 16267, patented December 23, 1856 by Ralph Collier of Baltimore Maryland. 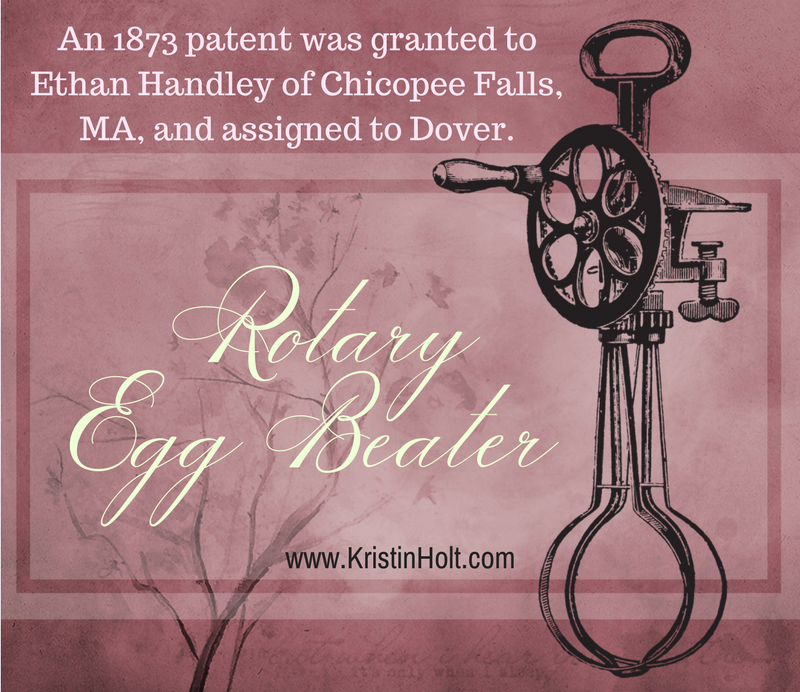 the FIRST United States-patented Rotary Egg-Beater. Image: Google Patents. 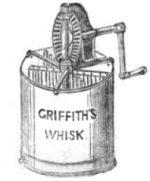 “Egg beater invented by E.P.Griffiths of London, patented in 1857. “Every revolution of the handle gives 288 strokes.”” Image: Home Things Past. “PATENT EGG BEATER. 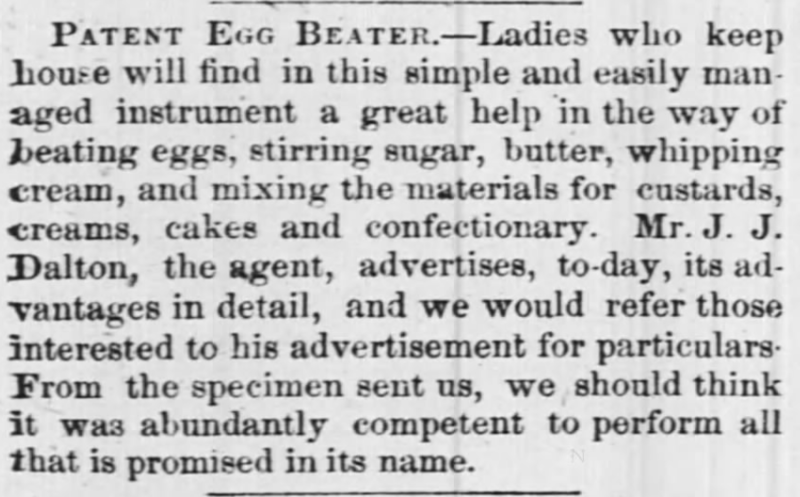 –Ladies who keep house will find in this simple and easily managed instrument a great help in the way of beating eggs, stirring sugar, butter, whipping cream, and mixing the materials for custards, creams, cakes and confectionary [sic]. Mr. J. J. Dalton, the agent, advertises, to-day, its advantages in detail, and we would refer those interested to his advertisement for particulars. From the specimen sent us, we should think it was abundantly competent to perform all that is promised in its name.” Published in The Times-Picayune of New Orleans, Louisiana, November 27, 1857. 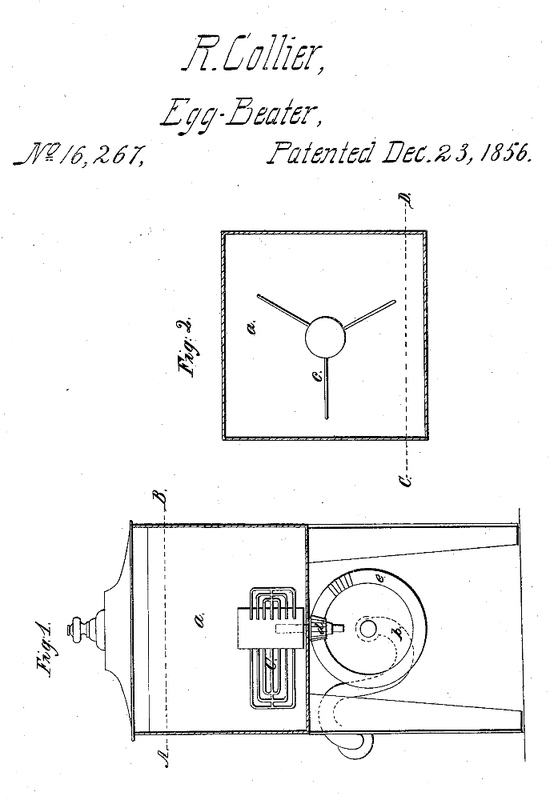 Miller & Dalton’s “Valuable Invention: Patent Egg Beater: Important to the Ladies–Labor Saved–Cost Trifling–Simple and Useful. 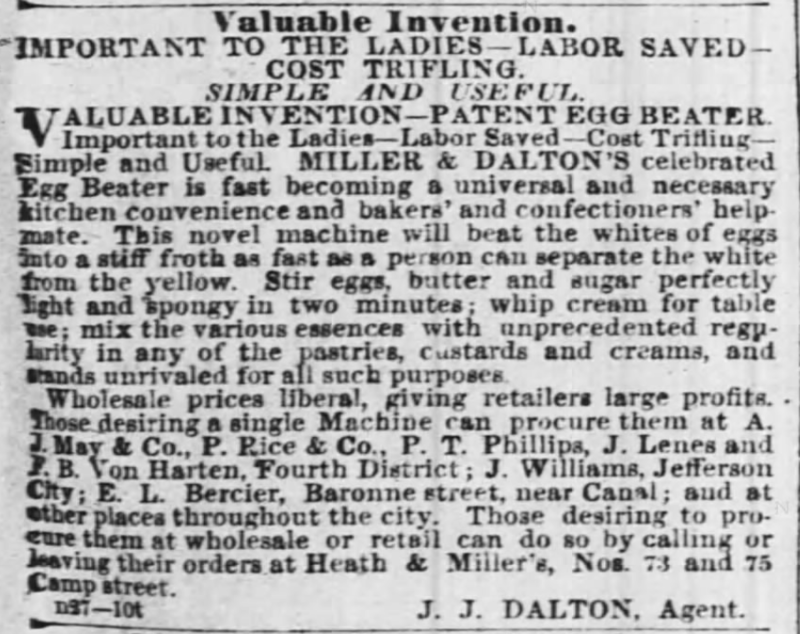 Miller & Dalton’s Celebrated Egg Beater is fast becoming a universal and necessary kitchen convenience.” Published in The Times-Picayune Newspaper of New Orleans, Louisiana, on November 28, 1857. [From the Scientific American] Yep, this particular egg beater: Heigh’s Egg Beater! and its invention (by John H. Heich) made the Scientific American in 1858, and advertisements such as this, in The Buffalo Commercial of Buffalo, New York, on April 7, 1858, loved to tout that “sighting”. Beat SIX EGGS IN TEN SECONDS!! One of the most useful aids to domestic economy we have ever seen. 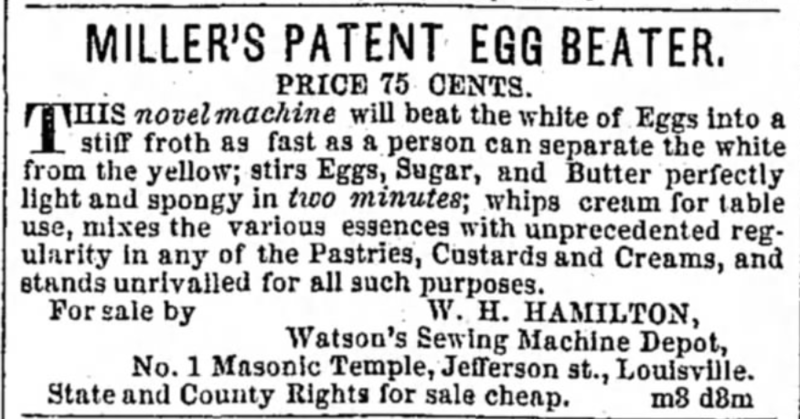 Miller’s Patent Egg Beater advertisement actually lists a price! (unusual for those days) 75 cents! Published in The Louisville Daily Courier of Louisville, Kentucky on April 9, 1858. What cost $0.76 in 1858 would cost $21.57 in 2017. United States Patent No. 23,694 awarded April 19, 1859 to J.F. & E.P. Monroe, “Egg-Beater”. Inventors: James J. Thomas and Edwin P. Monroe. Image Source: Patents.Google. EGG BEATER.–We call attention of our readers to the “Improved Egg Beater” advertised in another column. It is an excellent invention, is easily used, and those persons who have used them say they would not be without one for treble [sic] their cost. 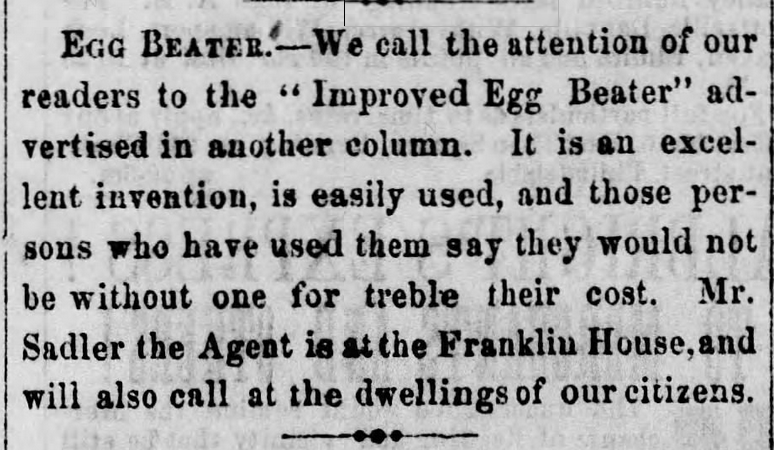 Mr Sadler the Agent is at the Franklin House, and will also call at the dwellings of our citizens.” Published in the Reading Times of Reading, Pennsylvania on July 30, 1859. 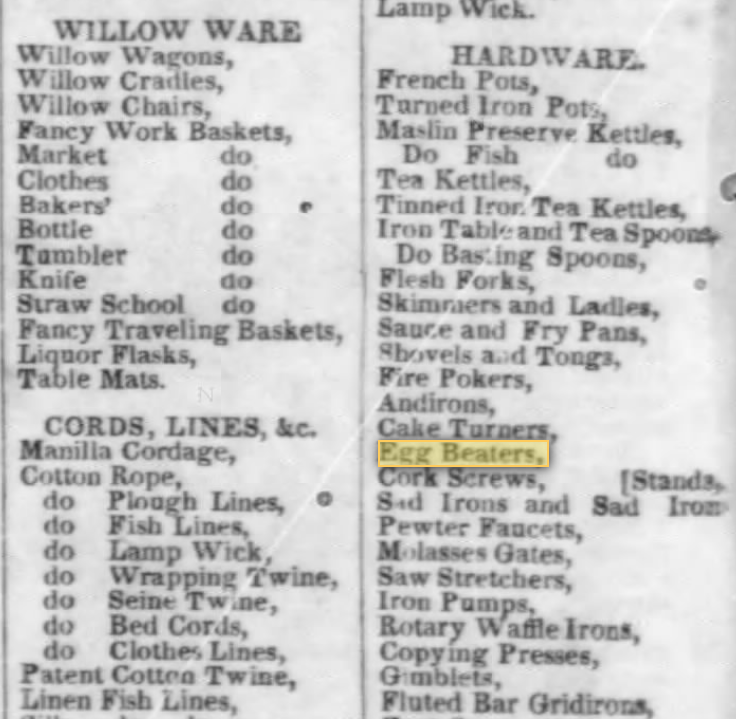 “Useful Novelties”–including Patent foot scrapers, ornamental umbrella stands, and the all important “patent egg beaters”, French roll pans, and more. For sale at PIPER & BRADFORDS. Published in Sugar Planter newspaper of Port Allen, Louisiana. October 29, 1859. 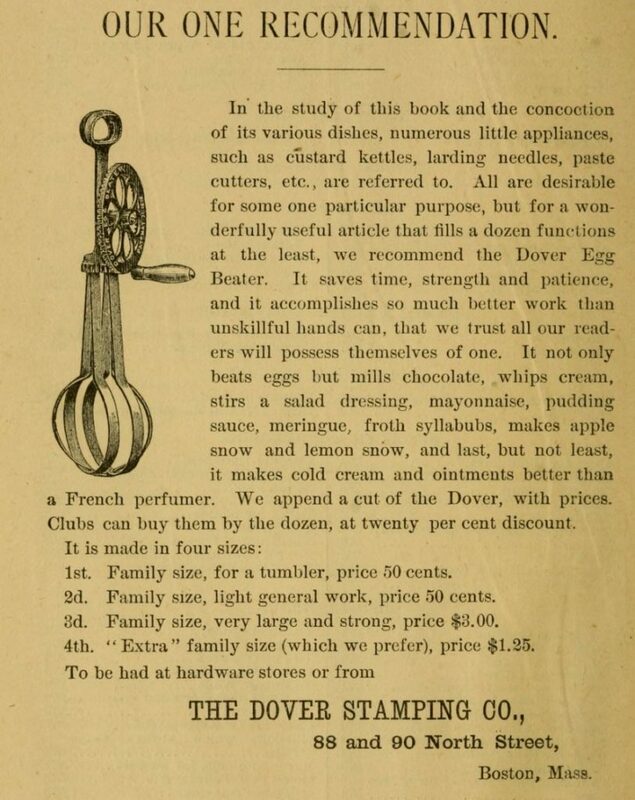 Dover Egg Beater Advertisement, published in The Home Messenger Book of Tested Recipes, 2nd Edition, by Isabella Stewart, 1878. What cost $0.50 in 1878 would cost $12.90 in 2017. What cost $3 in 1878 would cost $77.41 in 2017. What cost $1.25 in 1878 would cost $32.26 in 2017. African American Willis Johnson‘s U.S. Patent No. 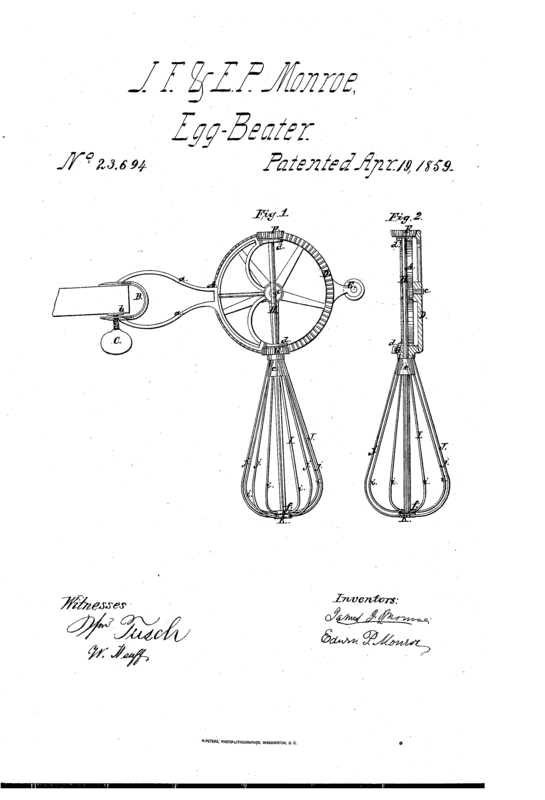 292.821, patented February 5, 1884: Egg Beater. Image: Google Patents. 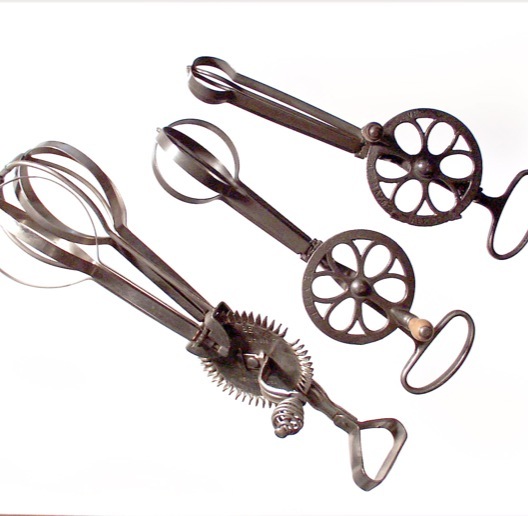 Egg Beaters: “Easy Egg Beater”– It consists of a spirally coiled wire, which in use opens and closes with exceeding rapidity, and instead of cutting the egg, as most beaters do, thoroughly aerates it, which is acknowledged by all experienced cooks to be the only correct way of beating an egg. 8 cents each, $0.87 per dozen. 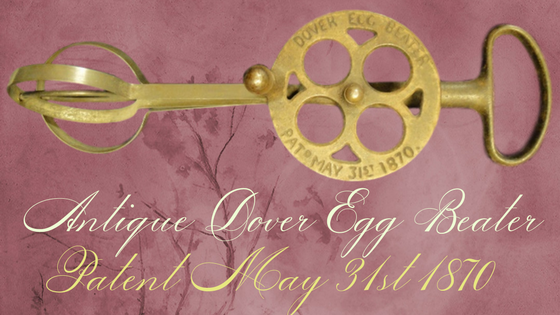 Dover Egg Beaters, each 10 cents or $1.08 per dozen. Surprise Egg Beater, retinned. Each $0.05. Spoon Egg Whip, with wood handle. Each 5 cents, or per dozen, 40 cents. Published in Montgomery Ward Spring and Summer Catalog, 1895. What cost $0.08 in 1895 would cost $2.39 in 2017. What cost $0.10 in 1895 would cost $2.99 in 2017. What cost $1.25 in 1895 would cost $1.49 in 2017. Dover Egg Beater (each 9cents, or $1 per dozen); Surprise Egg-Beater (spoon with woven wires), each 2cents, and Egg Whip (with wood handle). Each 3 cents (concentric ovals). Published in Sears Catalog No. 104 in 1897. What cost $0.09 in 1897 would cost $2.69 in 2017. What cost $0.02 in 1897 would cost $0.60 in 2017. What cost $0.03 in 1897 would cost $0.90 in 2017. 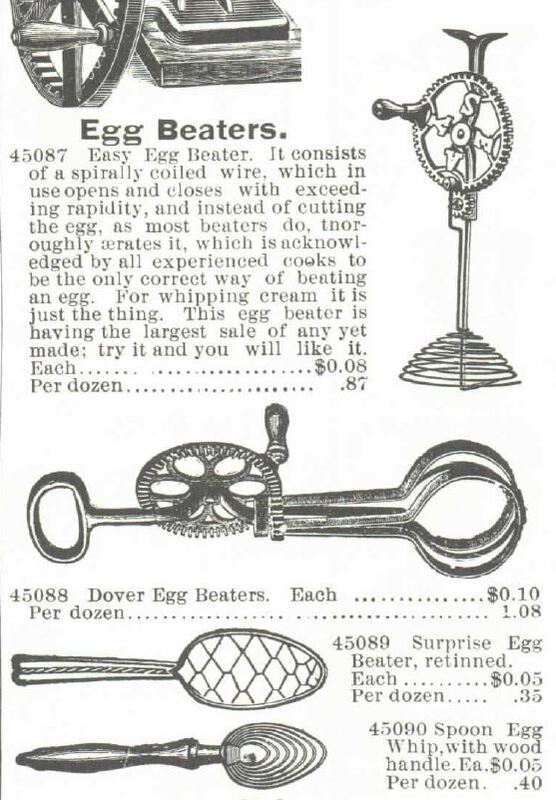 Taplin’s Dover Egg Beater Advertisement, 1899. Rotary Beaters had been invented in time for use in making Angel Food Cakes. 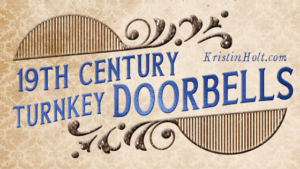 Why, do you suppose, do these vintage recipes not mention this new, exciting, household item? CAKES. –An earthen basin is best for beating eggs or cake mixture. Cake should be beaten with a wooden spoon. 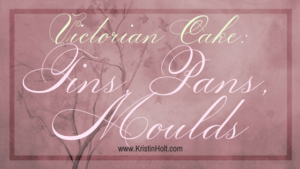 It is well in making cake to beat the butter and powdered sugar to a light cream. In common cakes, when only a few eggs are used, beat them until you can take a spoonful up clear from strings. 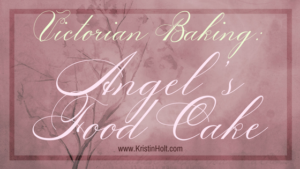 To ascertain whether a cake is baked enough, pass a small knife-blade through it ; if not done enough, some of the unbaked dough will be found sticking to it ; if done, it will come out clean. TO BEAT EGGS.—In making cakes it is of the utmost importance that the eggs should be properly and sufficiently beaten ; otherwise the cakes will most certainly be deficient in the peculiar lightness characterizing those that are made by good confectioners. Home-made cakes, if good in other respects, are too frequently (even when not absolutely heavy or streaked) hard, solid and tough. This often proceeds from too large a portion of flour, and too small an allowance of butter and eggs. The richest cake that can be made (provided it is light and well baked) is less unwholesome than what are called plain cakes, if they are solid or leathery. 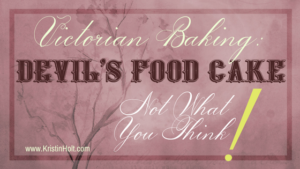 Cakes cannot be crisp and light without a due proportion of the articles that are to make them so ; and even then, the ingredients must be thoroughly stirred or beaten ; and of course thoroughly baked afterwards. Persons who do not know the right way, complain much of the fatigue of beating eggs, and therefore leave off too soon. There will be no fatigue, if they are beaten with the proper stroke, and with wooden rods, and in a shallow, flat-bottomed earthen pan. The coldness of a tin pan retards the lightness of the eggs. For the same reason do not use a metal egg-beater. In beating them do not move your elbow, but keep it close to your side. Move only your hand at the wrist, and let the stroke be quick, short, and horizontal; putting the egg-beater always down to the bottom of the pan, which should therefore be shallow. Do not leave off as soon as you have got the eggs into a foam ; they are then only beginning to be light. But persist till after the foaming has cased, and the bubbles have all disappeared. Continue till the surface is smooth as a mirror, and the beaten egg as thick as a rich boiled custard ; for till then it will not be really light. It is seldom necessary to beat the whites and yolks separately, if they are afterwards to be put together. The article will be quite as light, when cooked, if the whites and yolks are beaten together, and there will then be no danger of their going in streaks when baked. The justly celebrated Mrs. Goodfellow, of Philadelphia, always taught her pupils to beat the whites and yolks together, even for sponge-cake ; and lighter than hers no sponge-cake could possibly be. When white of egg is to be used without any yolk (as for lady-cake, maccaroons [sic], meringues, icing, &c.,) it should be beaten til it stands alone on the rods ; not falling when held up. Hickory rods for egg-beating are to be had at the wooden-ware shops, or at the turner’s. For stirring butter and sugar together, nothing is equal to a wooden spaddle [sic]. It should be about a foot long, and flattened at the end like that of a mush-stick, only broader. Spoons are very tedious and inconvenient either for beating eggs or stirring butter and sugar, and do not produce proper lightness. ~ The Lady’s Receipt-Book ; A Useful Companion for Large or Small Families, by Miss Leslie. 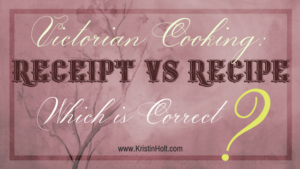 Being a Sequel to her Former work on Domestic Cookery. Published, 1847, in Philadelphia. 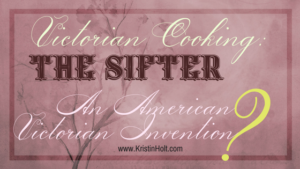 American Cooking: The Sifter ~ An American Victorian Invention?